The day started off beautifully sunny and almost warm, but by the end of the day, a winter storm chased me down the mountain. 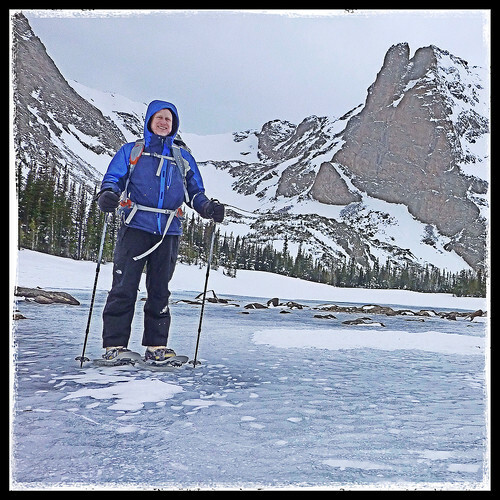 Through the years, I’ve driven by many people gearing up to head into the winter conditions in the Rocky Mountains. I’ve always admired those people, but had to admit that it was a little intimidating. 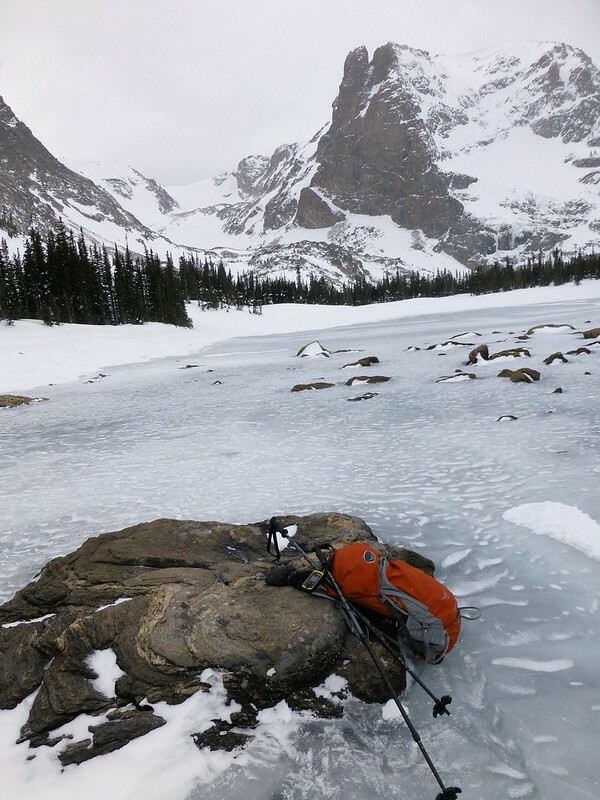 Was it courage or insanity that drove people to bundle up and head into the winter wilderness? I’ve firmly joined the ranks of those brave or perhaps slightly crazy people who wander the wilderness alone in winter. 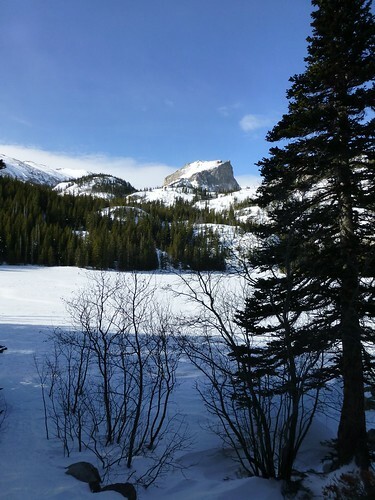 The day started out sunny and beautiful at Bear Lake, one of the most popular places in Rocky Mountain National Park. In the parking lot were two other cars with individuals gearing up to head into the cold. At this time of year, Bear Lake is frozen. Unlike the warmer months, there are no tourists meandering around the lake. The Park Service has done a wonderful job of making Bear Lake an inviting place for everyone. A wheelchair-accessible trail wraps around the entire lake. The destination has become so popular that the Park Service now runs a shuttle to various locations along the road that leads up to Bear Lake. 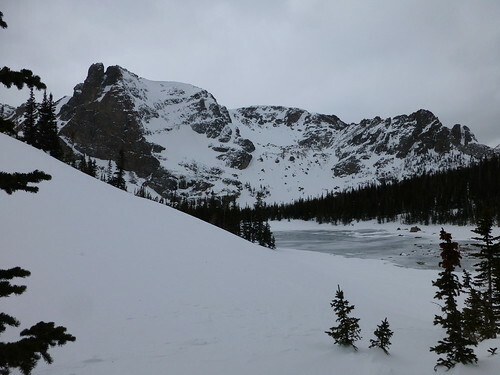 After donning my snowshoes and winter gear, I headed around the Lake and began gaining a little elevation on the Flattop Mountain trail. 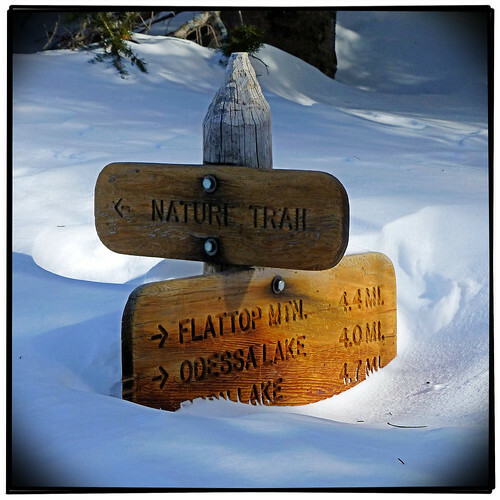 The Flattop Mountain trail is easy to follow, as the trail is marked with orange tags on the trees. 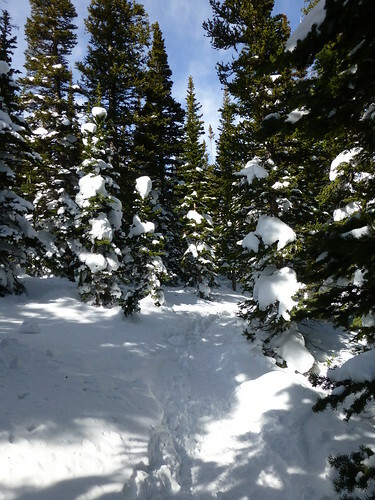 However, I soon broke off to follow the Fern Lake Trail, which is not marked for the winter. 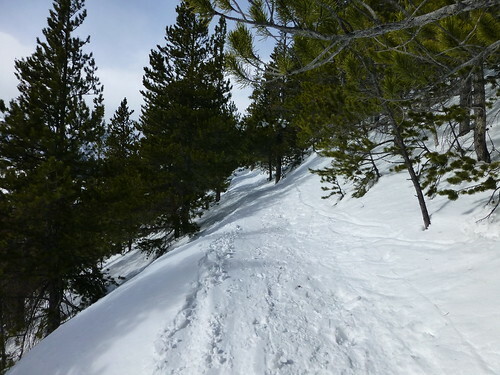 However, it is relatively easy to follow, as the trail has been well packed by many snowshoes and cross country skis. The views were fantastic and well worth the effort of the slow climb. some time, but eventually, I realized that I was a bit north of the official trail, and I was losing elevation as I began to round the north side of Flattop Mountain. I knew that I needed to get back to the trail. Breaking your own trail, uphill in a mountain forest is some serious work, but turned out to be well worth the effort. I crossed over where the official trail is, at least where it is when there is no snow. I followed a number of random cross country skier paths, meandering through the forest, generally heading in the right direction. 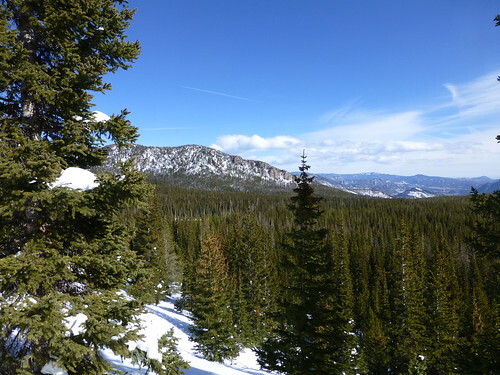 My day completely changed when I broke into an open space in the forest, and the peak of Flattop Mountain loomed above. I decided that I would completely forge my own path to the lake, and get above tree line in the process. 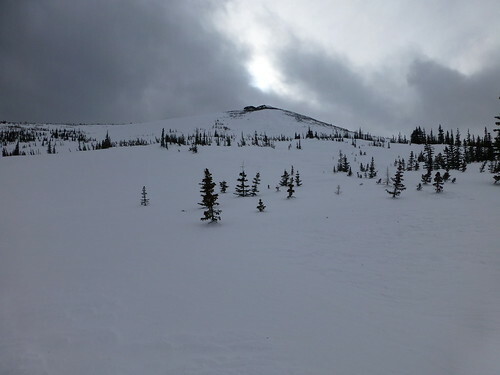 If not for the storm, and not having my crampons, I might have considered a push to the summit. While I have been above tree line in the wintertime while downhill skiing or driving, this was my first experience in total frozen isolation. I pushed forward, making myself gain elevation as I moved toward treeline. The air became thinner and colder, as I watched the storm continue to build to the west. While I was comfortable in the winter gear that I was wearing, taking my hand out of my glove to check my GPS became a colder and colder prospect. In the mountains in the winter, it is easy to think about turning around and heading for “civilization.” This is especially true while watching a winter storm grow in the direction you are heading. Many times, I considered declaring victory, and simply turning around. It is in those moments, when you teeter on the line between courage and insanity, that you understand why you are in the mountains alone. There is the raw beauty of everything around you. No matter where you look, it is a postcard view. But what draws so many of us into the wild, isn’t the wild, it’s who we are in the wild. What some might call loneliness and isolation, is spiritual solitude and emotional empowerment to others of us. So often, we hear the term, Man versus Wild, as if we are something truly separate from the world we live in. The truth is that in our cushy little worlds, we are separate from the real world. In those moments alone in the wilderness, standing above the trees, feeling the wind howl across your face, that separation begins to mend. I moved across the side Flattop mountain, enjoying the cold wind on my face. In one way it was easier the higher that I climbed. The top of the snow had melted and refrozen as the cold front hit. I was able to walk on top of the frozen snow, rather that pushing through the powder. The descent to the Lake was easy compared to the trek up the side of Flattop. The Lake was frozen over, and the ice rippled from the elements. I tossed off my gear to have lunch, take some pictures, and post my status and location to Facebook and Twitter, via my iPhone connected to my Delorme InReach SE. While I love trekking alone, my family and friends tend to worry. The storm hit as I finished enjoying lunch. Having little desire to be stuck in what appeared to be even worse conditions than I expected, I headed down the mountain. Fortunately, the storm was moving slowly, and I was able to leapfrog with it all the way down to Bear Lake. I was able to get all my gear off and into my truck before the brunt of the storm hit. Rather than staying in Estes Park for dinner, and having to deal with winter driving conditions late, I headed to Lyons, CO to my longtime favorite microbrewery. Oscar Blues, for a burger and a beer. I’m very impressed you did this solo. I was just there and afraid I would get lost in the white wilderness! Thanks! It is so amazingly beautiful there in any season.